The author has used his thirty years of experience in industry to draw together the basic information that is constantly in demand. Facts, formulae, data and charts are presented to help the engineer when designing, developing, evaluating, fault finding and repairing electronic circuits. The result is this handy workmate volume: a memory aid, tutor and reference source which is recommended to all electronics engineers, students and technicians and is best kept within reach at all times. 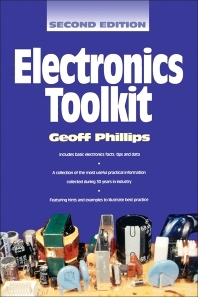 Have you ever wished for a concise and comprehensive guide to electronics concepts and rules of thumb? Have you ever been unable to source a component, or choose between two alternatives for a particular application? How much time do you spend searching for basic facts or manufacturer's specifications? What you want is the Newnes Electronics Toolkit. Electronic engineers; technicians; designers; HND, GNVQ, first degree electronics students; amateurs. Resistors, Capacitors, Inductors, Semiconductors, Sensors and transducers, Circuit concepts, Electromagnetic compatibility, Sound, Light, Heat, Connections, Appendix, Bibliography, Index.